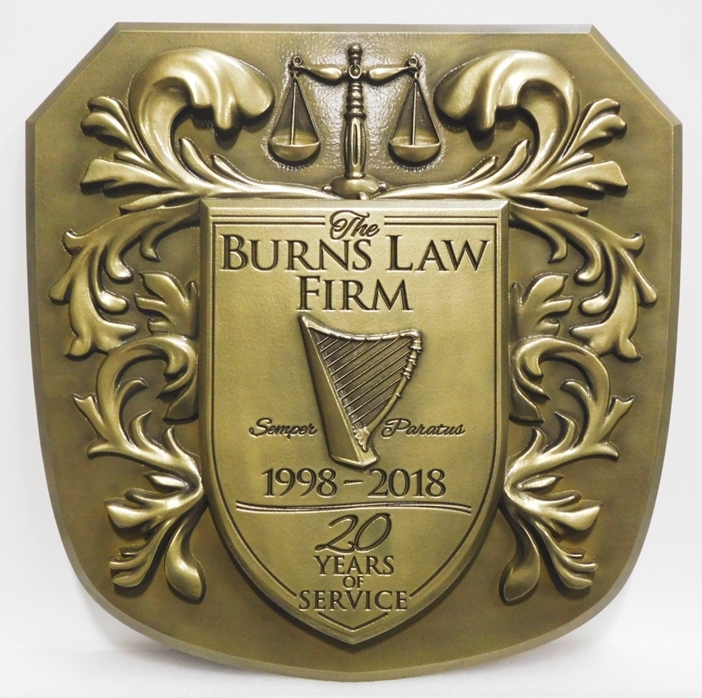 The coat-of-arms, 3D carved brass-coated HDU wall plaque shown above, was made for a Law Firm. 24K Gold-leaf gilding is also available for an even brighter finish. To see 250 other sandblasted, engraved, carved 2.5-D, or premium carved 3-D High-Density-Urethane (HDU) and wood signs and plaques for courtrooms, judge chambers, prosecutors, public defenders, attorneys, law offices, prosecutors, please click on Gallery 10 - Attorney , Law Office, and Courthouse Signs and Plaques. We can make a carved, engraved or sandblasted wood or HDU sign or wall plaque of any design in any size from 12 inches to 96 inches, for either indoor or outdoor use. These can be placed on iron or wood posts, a wall , a monument base, or on an outside or inside door. We can customize these signs with any shape, border, font style, or color scheme with carved (engraved) or raised text and art of your choice.